The first step in recovering from a data loss is to ascertain whether the loss is a result of a physical hard drive failure, i.e. broken hardware; or, a logical drive failure, i.e. corruption or loss of File System or data. This article identifies the symptoms of physical hard drive failure. An external USB drive adds another layer of USB electronics between the hard disk and the computer. These USB components are also subject to failure. When dealing with a failed external drive, part of the diagnostic procedure is to remove the drive from its case and try an alternate connection. Windows > Disk Management lists the physical drives recognized by the computer and the way in which the space on those drives is allocated. A "not initialized" error is a signal of a fundamental communication error. Usually an attempt to initialize a hardware failed drive will result in a low level "I/O" (Input / Output) error. 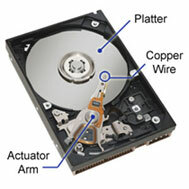 A traditional (non Solid State) drive contains disks called 'platters'. These platters are coated with a magnetic substance and spin at high speed under an mechanical arm (the 'actuator' arm) that moves backwards and forwards over the surface of each platter. On the end of this metallic arm is a small copper wire. The computer sends a pulse through this wire which changes the state of the magnetic surface of a platter as it passes underneath. In this way the files that you store on your computer are encoded into the magnetic substance. The tolerances within a hard drive are finely calibrated. As with any mechanical moving parts, the friction in movement creates heat. A physical problem (or pending physical problem) may therefore present as an abnormally hot drive. 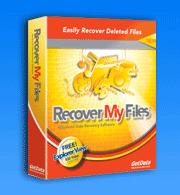 It may be possible on a degrading drive to successfully run data recovery software and retrieve data. Consideration should however be given to recovery techniques which will minimize drive access, for example, and MFT recovery rather than a block scan of the entire drive. It may also be prudent to attempt to acquire a sector by sector disk image of the problem media. In more serious cases it is necessary to send the hard drive a hard drive data recovery service. Hardware data recovery is a more expensive path as technicians may need to disassemble the hard drive to recover the data. Hard drive data recovery is usually done in a 'clean room' as hard drives are sealed to avoid errors caused by dust or other particles. Hard drives are finely tuned machinery and it takes specialist equipment to read the platters from a physically damaged drive. If you are sending your hard drive to a data recovery specialist then you should attempt to obtain an upfront estimate of fees (although you will rarely get one), ask that if you send your hard drive for quotation purposes will they send it back to you in the same condition if you choose not to use the service, and make sure you send it to a reputable company as you may only get one chance at hard drive data recovery.